FastStep Elite player Laura Brownlie was lucky enough to train this weekend with some of the top players in the country as part of an event by National Badminton League side Surrey Smashers. 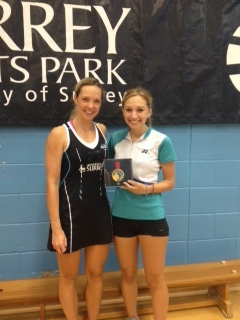 Laura was invited to the promotional event organised by the Surrey Smashers at Guildford Sports Park including world number 5 ranked mixed doubles player Gabby Adcock. Surrey Smashers start their campaign in the new NBL on 6th October away at MK Badminton in Milton Keynes. All games will be streamed live online for free by Sky as well as being on its paid sports channels.